Foiling the Fungus and restoring your home. You have seen it in your home and maybe even at work: Mold. Mold is a serious problem yet you should not panic. Our mold removal team is here to help eliminate this threat and return your home to normal. We will tell you all about mold, answer your questions and address your concerns. The bottom line is mold should not cause you to panic. At its core, mold is a moisture issue. Let our team tackle your mold problem and we will identify the underlying source of moisture, eliminate the mold and help you prevent its return. Mold typically grows on porous spaces like drywall and wood. However, it also has the potential to grow on plastics, glass and metal. At its core, mold is a moisture problem. Remedy the moisture, correct the mold issue and your home will be back to normal. However, this is not always DIY (do it yourself) project. You need an experienced mold removal crew of to eliminate mold from your living or working space in a safe, efficient and comprehensive manner. Performing the actual mold removal is much more difficult than understanding mold and what is required to eliminate it. Below, we delve into the basics of mold, mold removal and more. Give this guide a read and you will understand mold and mold removal without feeling intimidated by scare tactics. Mold can grow in any part of your home yet there are some spaces in which mold growth is especially common. The majority of homeowners find mold in the bathroom, basement and/or kitchen. The bathroom is by far one of the dampest areas of the house or apartment. Mold is especially common in the shower. Take a look at the shower curtain as well as the ceiling above the shower at least once every couple days to see if mold is growing. It will also help to open up the window after showering or taking a bath to air out this cramped space. If your bathroom does not have a window, consider adding a fan to your bathroom. Mold is also commonly found in the basement. This part of the home has the ideal conditions for the growth and spread of this substance. These are cool, damp spaces that are often neglected during cleaning routines. There is a chance mold will have spread throughout the basement before you even know it is there as you probably do not spend much time in the cellar. Mold forms in this part of the home if there is not a dehumidifier or if items contact the carpeting and/or drywall. Mold grows in kitchens as these spaces are rife with moisture. Mold typically grows around the plumbing/sink after leaks. Furthermore, water splashes around when washing dishes, preparing meals and during other activities in the kitchen. If spills are left in place, mold will eventually form. Mold requires a set of conditions to be in place before it can grow. Mold needs a source of food in order to live. It can live off of everything from drywall to wood and even cotton. Furthermore, the presence of moisture in the form of humidity or water leaks must be present. Mold also requires oxygen and 24-48 hours in order to grow. Leaks stemming from pipes are one of the top causes of mold growth. The worst leaks are those that are concealed within a wall. Once you find out the leak exists, mold will already be growing. Even a leak in the roof can cause mold in your home. If the roof leaks down into the attic, you probably won't know about it until mold is already growing. Take a look at the ceiling beneath your attic and the attic itself on a regular basis. A home that is poorly ventilated will put you at risk for mold exposure. Insufficient ventilation forms pockets of moisture and idle air, allowing for rapid mold growth. Furthermore, if there is an abundance of humidity that is not circulated to outdoor areas, there will be an imbalance in moisture that has the potential to cause mold growth. A flooded home will almost certainly have some mold issues. It might take upwards of a couple weeks for your living space to completely dry out. In order to grow, mold merely requires an acceptable surface to be moist for 24 hours. Even a damp basement with a high level of humidity or moisture and minimal ventilation will lead to mold growth. Water can also build up in the ground along the base of your home. This buildup of water can threaten your home's foundation and spur mold growth in due time. Mold has over 100,000 variations. This is a living organism that requires food and water to live. Food sources are, unfortunately, pretty easy to come by in a home or property. Dust, debris, dirt, and other organic material are all food for mold growth. Eliminating water or moisture is the easiest way to combat mold growth. There is a common misconception that a mold test or inspection is necessary even after the mold has been spotted. There is no need to perform an inspection if it is known mold is in the home. If you see mold, you have mold. Though there might be a few cases in which we determine it may necessary to test for mold after it has been spotted. For example, if a member of your family has a health problem and the source of it can’t be identified, it will make sense to check the home for mold. Mold tests are also performed in the context of landlord/tenant legal disputes and real estate transactions. During an assessment, we use a moisture meter to gauge the level of moisture on the surface of your floors and walls. If we find these surfaces have any moisture content at all, it is a sign water is present and there might be a mold issue. 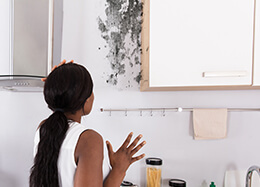 If you have not spotted mold yet smell a musty scent or believe mold might be present, reach out to us right away so we can perform a mold test. We can determine if mold is present, and help remove it from your home or commercial property. Surface sampling might prove helpful to gauge if an area has been properly cleaned. Mold sampling must be performed by proven professionals who have an abundance of experience designing protocols for mold sampling, methods of sampling and analyzing results. The analysis of the sample must adhere to the American Industrial Hygiene Association’s nuanced analytical methods. Furthermore, testing and assessment should also occur after the mold has been removed to ensure the issue has been fully resolved. Those mold test kits you find at the store are not worth the money. Mold samples commonly provide false results or misleading results. Furthermore, the interpretation of such tests results requires the assistance of a mold expert. More importantly, this type of DIY test does not involve a visual analysis performed by a mold professional. The bottom line is mold is omnipresent. The question is whether your home or working space has an abundance. Don’t put your faith in those home mold test kits. A kit doesn’t tell you how serious the problem is and where mold is located. Even the Environmental Protection Agency (EPA) has stated mold sampling should be performed by those who have experience in this field. The bottom line, if you see mold, you have mold. Have a professional do an assessment to determine your options for remediation. They can help guide you to find the right option for your property. Mold must be physically removed from your home or office. Mold is airborne so it has the potential to move throughout the building with ease. You need a reliable mold removal team to ensure mold does not spread. If your home has been flooded, remove all water-saturated items that can’t be cleaned and dried within the next day or two. Put these items outside of your home to eliminate as much moisture and mold as possible. Take a picture of the wet items for insurance purposes. Once it is safe to use electricity, dehumidifiers and fans should be used to eliminate moisture. Open your doors and windows and try to dry the area as much as you can, before your mold removal team comes in. When your mold remediation crew is working, they will likely seal off the area they are working in. This is so any spores they clean will not get into your ventilation system and spread to the rest of your house. About 40 percent of all the homes in America have mold issues. Some of these homeowners attempt a DIY (do it yourself) mold removal only to have it backfire in a big way. Though it might be possible to clean up a small amount of mold on your own, there is the potential for it to spread as you will not have the proper mold removal equipment at your disposal. You will have no way of knowing if mold has expanded across more than the space in which it is visible. In some cases, a DIY (do it yourself) mold removal is possible. Though not advised for medium to large accumulations of mold, DIY mold removal might prove successful for small areas like a minor accumulation of mold on the bathroom ceiling. Consider adding a fan to this space to prevent additional mold growth in the future. Furthermore, it will help to use the EPA’s website to understand this threat. The EPA website provides information about mold infestation levels and the protection required for a DIY removal attempt. Beware of disturbing the mold infestation. Once disturbed, mold infestations will send out millions of airborne spores. These spores can be sent flying around, worsening the problem that much more. This is precisely why the affected area’s air vents and heat should be sealed. It will also help to seal off the space by taping sheeting over the door. Do not touch mold with your hands! Wear gloves, goggles, a respirator and clothing you can toss in the trash after this project. 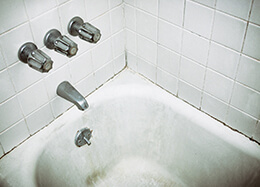 In general, a DIY approach might suffice for mold that grows in the tub, sink, glass, tile or metal. However, if the mold is growing on a surface that is not easy to clean, it makes sense to rely on our professionals to perform the clean. If you have any health issues that have the potential to worsen with such a removal effort, do not put yourself at risk. Give our mold removal team a call and we will take care of your mold problem. Prevention is essential to stopping mold from returning. If the mold stems from a leaky pipe, have a professional remedy it right away. Prevention extends to cleaning up spaces impacted by mold. Running a fan in the bathroom or dehumidifier in the cellar will help stop prevent the spread of mold. Furthermore, all damaged items should be washed promptly, or thrown away. After your removal, using a HEPA air purifier in your living or working space will help. This type of filter traps all those diminutive particles like mold spores that accumulate in the air. We use cold fogging to clear out bacteria mold, airborne viruses and additional contaminants from the surfaces and air of your living space. Once cold fogging is performed, you will be able to rest easy knowing contaminants have been eliminated from your living space. There will be no evidence of cold fogging as it does not leave any residue or harm any plants, electronics etc. Your air will be clean, fully sanitized and fresh. Fans are also another excellent option to control moisture and ensure the fresh exchange of air. Add a couple fans to your home and they really will help in reducing moisture levels. Simply removing mold from the surface of the walls, floors or other spaces will not suffice. In order to prevent mold from returning in the future, the water source must be identified and fixed. It is important to note several chemical products are on the market that supposedly encapsulates mold. Such products are usually reserved for use after another anti-microbial kills the mold. The encapsulants function as another layer for mold protection. However, these products are not resistant to mold or mold proof. Some homeowners have had success with sealing wood as well as concrete with chemicals that serve to water-proof these spaces. Sealed wood can prove highly resistant to water damage. So go ahead and apply a primer to seal your wood and guard against water damage. This primer will prevent moisture exposure and also decrease odor. If you are hesitant to lean on a mold removal professional to take care of your mold problem due to cost, do not assume these services are out of your price range. Mold remediation is not always an expensive project. In certain cases, minor mold issues can be cleaned by the property owner. However, it is always better to be safe than sorry. 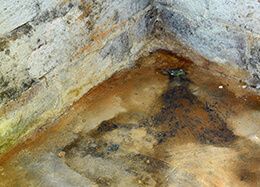 If you suspect your mold issue extends beyond 10 square feet, the assistance of mold removal experts will be required. Mold problems typically occur following a leak, flood or another form of water exposure. If you can’t identify the source of the mold, there is a good chance it will return. 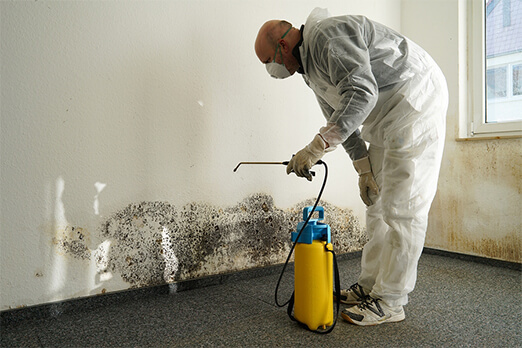 Our mold remediation crew knows the common causes of water exposure and subsequent mold. So don’t assume simply applying a mold cleaner to the obvious mold sites will suffice. Consider an instance in which mold is on your drywall. You will have no idea it is there or the best way to remove it unless one of our mold remediation experts performs an in-depth analysis. Our professionals know exactly how to identify and clean mold, regardless of its location in your home. Just as important is the fact that we have all the proper safety equipment necessary to perform a complete mold removal without jeopardizing your health. From goggles to gloves, respirators and beyond, our mold removal experts have all of the protection necessary to ensure the safest possible clean. We are the mold removal team you can trust. 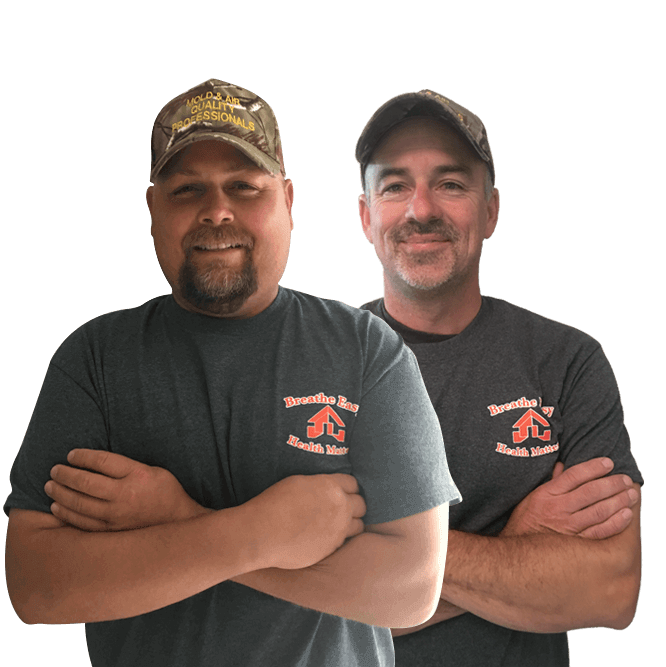 Our crew has been in business for more than 15 years. We refuse to use scare tactics. An informed customer is a better customer. 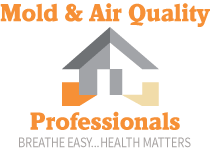 At Mold & Air Quality Professionals we explain your options and go over ways that you can address the problem, and how we can assist you. We follow remediation and EPA guidelines based on national standards and keep our certifications up to date with continuous ongoing training. We are honest, thorough, and efficient. You won’t have to pay a minimum charge for our service. We charge according to each unique case. This means you will always get the best rate when you lean on Mold & Air Quality Professionals for your mold removal project. You will only be billed for the time worked on the project and the cost of the mold-removal products used. Let our team inspect your living or working space to pinpoint the cause of the problem. We will discuss the mold situation with you in-depth, explain our strategy for removal, and get to work. Our crew is more than willing to answer all of your questions and address your concerns. We will explain why the mold is present, why it grew and how to prevent it from coming back. We are especially proud of our team’s ability to remove mold stains. Such removal might seem impossible to other mold removal companies yet we embrace this challenge. This way, those unsightly stains will be eliminated right along with the mold itself. We know all the best methods to remove mold from all sorts of different surfaces from tile to siding, grout, wood and beyond. Those who are looking for an eco-friendly option should inquire about mold remediation with our all-natural botanical solution. This approach makes use of organic products that are completely natural. In fact, we are so confident in our ability to remove your mold that we provide a service warranty. This confidence stems from our team’s diverse backgrounds, skills, and talents. We employ an array of mold specialists ranging from industrial hygiene consultants to forensic environmental specialists and certified remediation project designers. Whether you are looking for a mold inspection, test or remediation, we will get the job done. If you’ve got mold in your home, don’t panic. Call the team at Mold & Air Quality Professionals, for an accurate assessment of your mold issue. Let the staff at Mold Air Quality Professionals help you with your air quality and mold remediation needs. Fill out the form below for a free consultation.